Over five hundred simple mechanical movements from America's first one hundred years of the Industrial Revolution. 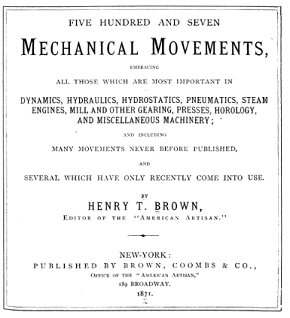 For those who share an interest in mechanical things, this book is addictive. Through the use of simplified, concise drawings, here are 507 of the small components which make up complex machinery in areas as diverse as C.R. Otis's safety stop for the elevator, Pickering's governor for a steam engine, Arnold's escapement for watches, compound parallel rules, piston rod guides, the grasshopper beam engine and a self recording level for surveyors. The list goes on and on in fascinating variety, with each movement explained and illustrated.